At least for me it was dinner. 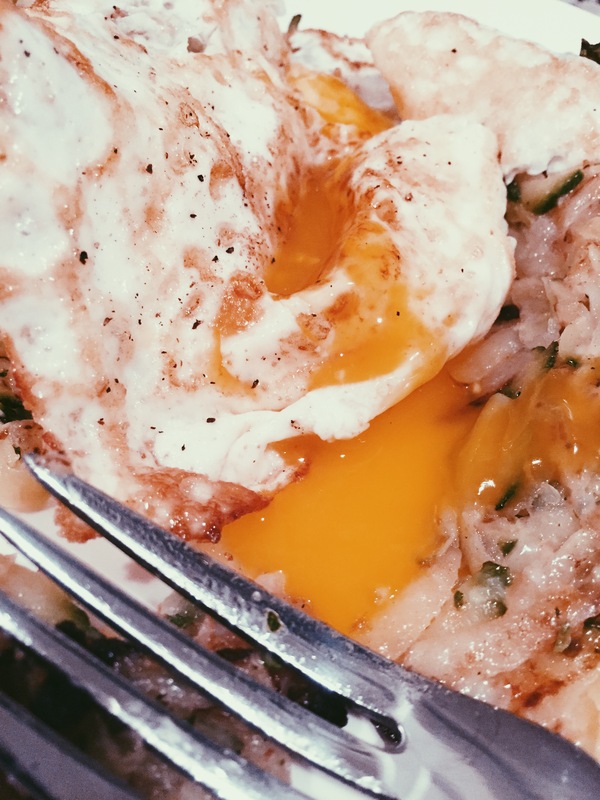 I almost never eat eggs for breakfast, but I would say I do eggs for dinner at least 2-3 nights a week. Omelette, sunny side up over sauteed spinach, or two fried eggs with toast and a bowl of peas. Oh, is that last one not a thing? This hash brown recipe is a little more high-maintenance because it requires planning and prep ahead of time. The trick to crispy hash browns is making sure that you get as much water out of the potatoes as you can so that they crisp up and don’t just steam through. Obviously adding zucchini and onion adds even more water, so this means extra dehydrating (?) time. I usually overdose on zucchini over the summer, but for some reason this year I really didn’t. Maybe it’s because I was playing the real life version of Where in the USA is Carmen Sandiego? Speaking of which, I miss that game. And Oregon Trail. And JumpStart! JumpStart 4th Grade, specifically. Back to the zucchs. (No?) I’m not quite ready for butternut squash season yet (although I am guilty of drinking a pumpkin beer over the weekend- Flying Dog’s The Gourd Standard Pumpkin IPA YUM), especially while summery produce is still on the shelves. These zucchinis were small- I used one per serving for this recipe. 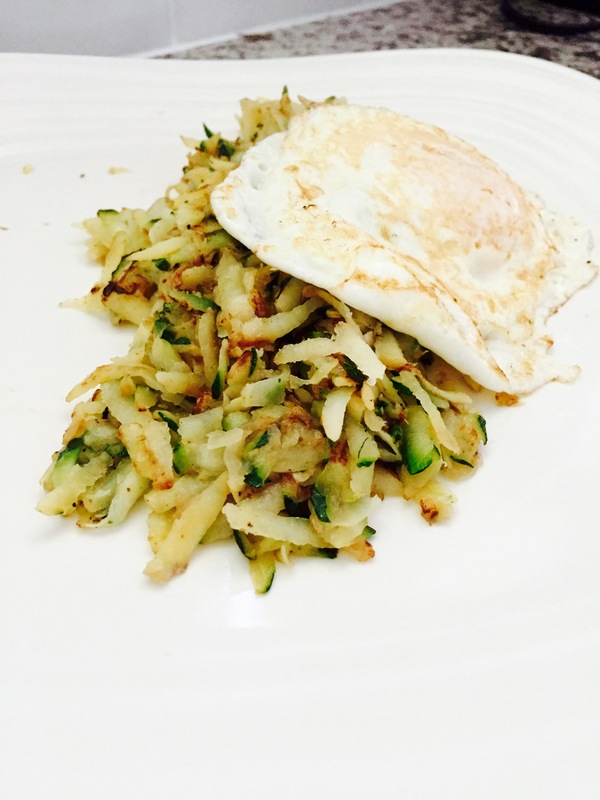 One potato and one zucchini makes you feel like you are eating double hash browns but it’s better for you than eating two potatoes <– math. 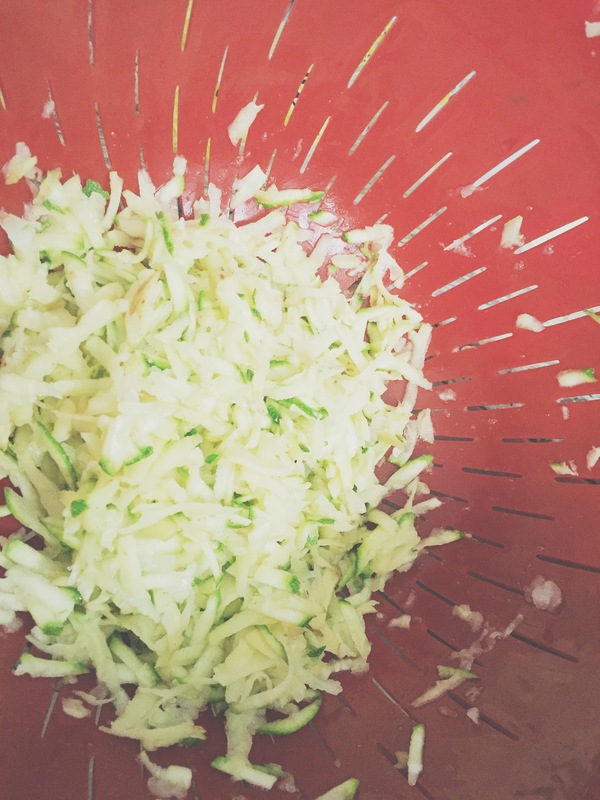 Grate your potato, zucchini, and onion. I mixed it all together and tried to squeeze out as much water as I could with my hands. Then I wrapped it up in a paper towel and wrung out some more. Then I stuck it all in a strainer and let it dry out EVEN MORE. Catch my drift? Heat some canola oil and butter together in a skillet. Canola oil for the higher smoke point, buttah for flavah. Add the potato/zucchini/onion mixture and let it brown on one side, then flip over. Add the garlic to the mix at some point. Season liberally with salt and pepper. And maybe garlic powder… you can never have enough garlic in my world. 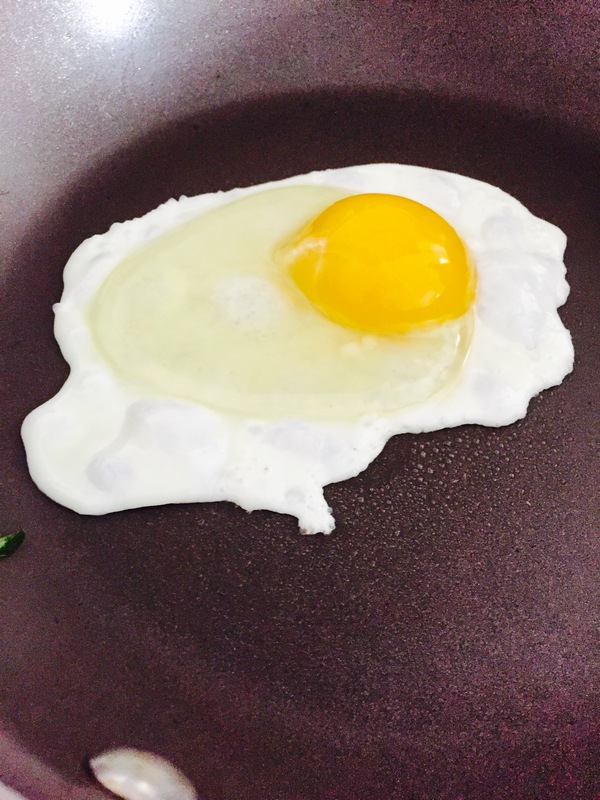 Fry an egg for the top. I may have also added a little bit of cheese. Which is an essential component of all “lightened up” meals, right?